Could your dog or cat benefit from herbal supplements? Note: This is a sponsored post. Read more to learn how you can win natural supplements for your dog or cat. NHV Natural Pet Products supports the well-being of dogs and cats. The company’s vet-formulated herbal solutions are designed to promote health and healing, according to its web site. Its products are made with 100 percent natural ingredients without additives or preservatives, according to NHV. They were formulated by an herbalist and a holistic veterinarian and are used and recommended by the College of Veterinary Medicine at the University of Tennessee. Could your pet benefit from NHV Natural Pet Products? Some of the products through NHV could benefit most pets while others are deigned to help pets with more specific ailments. Of course, it’s always best to consult with a veterinarian if your pet is not well. “NHV products are supplements that can be used to prevent possible health issues that certain breeds may be susceptible to or can be used to support a pet’s health and well-being when a health problem arises,” according to the company. Below are two examples of products from NHV that most pets could benefit from. The company sent me the following to give to my 8-year-old Lab mix Ace. 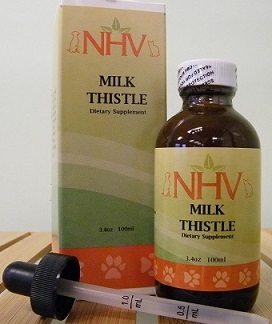 Milk thistle can be used to protect and strengthen the pet’s liver, according to NHV. I thought this would be a good supplement to start adding to my dog’s food because, unfortunately, I give him chemical flea prevention products and toxic heartworm prevention. It is also safe for long term use at the recommended dosage, according to NHV. I thought this product might help Ace because he tends to get sore joints after longer walks or playing. It’s hard to tell if it’s helped, but I plan to keep adding it to his food for the next month or so. I asked the company about other popular products even though they may not necessarily benefit my specific animals. While I haven’t given these particular products to my pets, they are examples of what’s available through NHV. I would also be interested in the company’s natural flea prevention products if not for allergies to the ingredients. Check out its full list of products here. 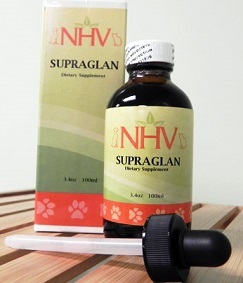 Supraglan is an all-natural, vet-formulated supplement to help dogs and cats deal with the symptoms of adrenal gland dysfunction such as increased thirst, frequent urination, hair loss or skin problems, according to the web site. It helps, regulate water and electrolyte levels. This product is formulated to help dogs and cats with kidney disease and kidney failure, according to NHV. The herbal remedy promotes proper urinary health and can ease painful urination. NHV Natural Pet Products is giving away a free bottle of yucca and a free bottle of milk thistle to one lucky winner. To enter: Leave a comment below telling me why your dog or cat would like to win. I will select the winner at random on Monday July 14. Must have a U.S. or Canadian mailing address to win. *Congrats to Kellie! Plus, newsletter subscribers have a second chance to win! Watch for the next newsletter for info on how to enter the second drawing. 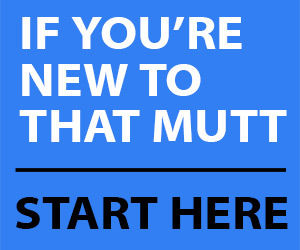 If you are not subscribed to That Mutt’s newsletter, you can do so below. The newsletter goes out 3 or 4 times per month and is a digest of recent posts. *Congrats to Mary! Do you think your pet would benefit from herbal supplements? We used to prescribe milk thistle to birds with liver issues all the time. I’ve also heard Yucca is good for gassy dogs. Maybe I need to get some for Shiner. She has been pretty gassy lately! Good to hear milk thistle can help all sorts of different animals. It’s also good for people, I hear! I think it just depends on the situation. We have tried lots of natural stuff and had little luck, but if the situation is right we would give it a try. Yep, I think you’re right. I know quite a few pet owners will use natural products in addition to or in rotation with the more conventional options. Sometimes that may be the best option for some pets. Yucca is also given to horses for pain and inflamation as well, and I’ve heard good things about it in horses so it should be good for dogs and cats too!! And yes, I would give the Yucca at least a month to see if you see a difference. Sometimes the body has to attain a certain level before the effects really show! Oh, good to know about the horses. Thank you! My old neighbors use milk thistle for their pug. His liver numbers have went down! I would love to try the NHV products with my dog. I really like the idea of natural, holistic supplements for both people and animals. I used The Missing Link for my Belgian tervuren when we first got her. She was a rescue & had been living in a parking lot for at least 6 months. It helped her coat & just gave her some much needed extra nutrition. I, too, worry about the heart worm & flea meds I give my dogs. I’ve REALLY struggled lately with the vaccination issue. Then we’ve got insecticides etc. for our lawn. Knowing the benefit of many natural herbs, vitamins & minerals for humans, I can’t help but believe they would benefit my animals. Just like us, they are what they eat. Oh yes, I’ve given my dog Missing Link before as well. I would love to try this for my 9 year old chi, Stella. Her last blood work showed high liver functions. This looks great!! I am so glad to find this web site. We are having such a bad time with fleas here in Ohio in August 2015. We are trying to get rid of them in a natural way with a vinegar, lemon juice, witch hazel and water sprayed on my cat’s coats. The recipe is 1/2 gallon water, 1 gallon white vinegar, 16 oz. lemon juice, 8 oz. witch hazel. We also use this to spray the floors in basement and garage. The lemon juice can be bought in a bottle at the supermarket. We are using borax on the carpets along with shallow dishes with water and Dawn dish washing detergent with a votive battery operated candle in the middle of the dish. I put this to work at night as the light draws the fleas to it and then they die in the soapy water. I really don’t want to try bombing the house with chemicals, but it might be the last option.